Discover a revolutionary new method of rapid learning, designed to increase your intelligence – and therefore improve every aspect of your life! Have you ever wondered why some people seem to absorb and retain information effortlessly – and are able to recall it, instantly, whenever they need it? Because of an uncanny ability to learn very quickly and retain practically everything, these people move ahead in life with amazing speed. They get raises, promotions, recognition. They seem more productive, but less stressed. They always appear to be "on top of it," one step ahead. They seem to know everything! So what do they have that you don't? They've simply learned something you haven't: how to access their own personal Super Computers – their brains. You have absolutely everything you could ever need to succeed locked away inside your head. The problem, though, is that you (along with most other humans) use only about 10% of your brain power. Your brain controls billions of cells, and you're hard-wired for learning and success whether you know it or not. So what if you could begin increasing the percentage of your brain that you put to use each day? Think of your brain like a super computer: you can fire it up at will and search your mental filing system for whatever information you need. It's time to fire it up. And that's exactly what I teach you in my "Accelerated Learning Techniques" Plus Bonuses package. I reveal my best, proven secrets for developing the memory and the sharp mind you've always dreamed of, simply by using your brain in a whole new way. 3 Ways to demonstrate your new found knowledge...without coming off like a know-it-all. Sound good? Are you ready to fire up your Super Computer? 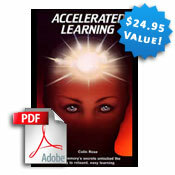 Order your copy of "Accelerated Learning Techniques" Plus Bonuses now! The express track to super intelligence. Access your genius potential. This 6-CD set will have YOU tapping into your own amazing abilities as you awaken the true power of your brain. PLUS, you get a workbook to personalize your journey to super-intelligence! A special report documenting some of my research into the Learning Revolution. Appropriate reading for today's information overloaded person. This interesting report exposes the shifting paradigms of our rapidly advancing world. An additional special report documenting my research into the Learning Revolution. In it, I lay down the groundwork for the coming changes in society and the work place. As you study this report, you will find yourself opening up to new ideas and aspirations to make your life better. You will be prepared for the coming changes in the world. And of course, as with all my products, "Accelerated Learning Techniques" Plus Bonuses is covered by my 100% Satisfaction Guarantee. That is, buy the package, try the techniques therein and apply them to your life. If, within a year of your purchase, you're not completely satisfied, return the "Accelerated Learning Techniques" CDs for a full refund – keep the bonuses as my gifts to you. No questions asked. Ready to take me up on this no-risk offer? 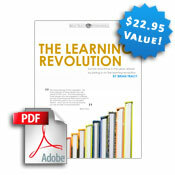 Order your copy of "Accelerated Learning Techniques" Plus Bonuses here! These very same techniques for rapid learning have taken me from being broke and homeless to becoming the owner of several successful multi-million-dollar global businesses. They've worked for thousands of my students around the world. And they WILL work for you. 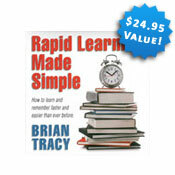 See for yourself when you order your copy of "Accelerated Learning Techniques" Plus Bonuses. My Black and White 100% Iron-Clad Satisfaction Guarantee! Take your time to enjoy your products and put the proven strategies to work for you in your life and business. 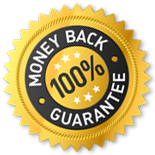 If for any reason or no reason at all you are not completely satisfied with your product, just return it within 365 days and you'll receive a full 100% product refund. That's a full year to put us to the test, use the information, put it to work, and make your dreams come true—all the risk is on us! The accelerated learning program gave me some very important insights and some important tools. I am using most of its tools. Thanks Brian for the awesome program!! I am 41 year old comic entertainer. The program is helping me push forward and learn and create new things. I enjoy how Brian teaches and I enjoy the books that came along with it as well. I think he his actually very good for helping artist stay afloat. Your most powerful and valuable asset in the information age which we live in, is to acquire knowledge and skill and the ability to apply that knowledge in a timely matter to create the results you want and the results which others will pay for. Put simply, this is the BEST course I have ever seen to help you do so quicker, easier and in a more fun and relaxed fashion than the competition in your field, hence allowing you to achieve excellence and stay ahead for the rest of your life. Over the past few years I have listened to dozens of audio programs, attended numerous seminars and read hundreds of books, and this has become an instant favorite of mine! and yes, like all the other people mentioned, BUY THIS BEFORE you buy anything else, it will enhance your ability to absorb and remember information for the rest of your life, so it would only make sense to start with this wonderful course.